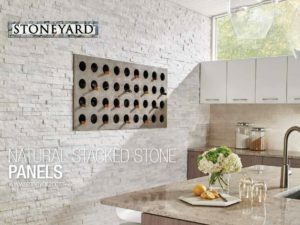 Natural Stacked Stone Ledger Panels are trimmed pieces of REAL stone affixed together to form modular interlocking panels. This allows for a fast and efficient installation of a beautiful dry stacked stone veneer. Stoneyard® Stone Panels are available in both FLAT interlocking stepped panels and CORNER “L” interlocking panels for 90° outside corners. Need help deciding? Select one of the color options below to narrow your choices. Looking for Thin Stone Veneer? Stone Panel flats are sold by the 6 inch x 24 inch (1 square foot) panel in boxes (quantity per box varies depending on the color). Corners are sold by the "L" corner panel and come in a few different sizes depending on the color. The most popular size corner is shown above. Each corner will have a short side and a long side and is 6 inches in height.